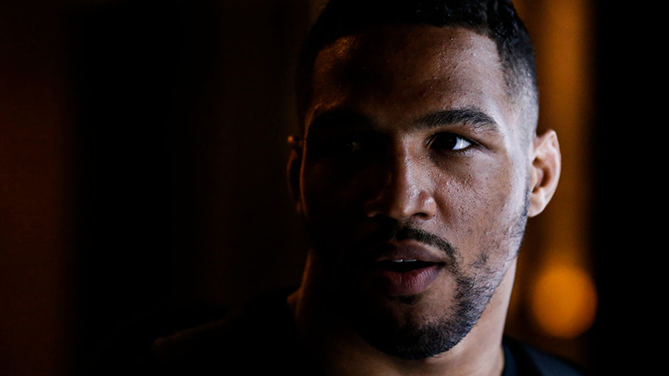 It was a bit surprising that Kevin Lee kept a low profile on the biggest night of the year for the lightweight division. But as Khabib Nurmagomedov, Conor McGregor, Tony Ferguson and Anthony Pettis took the UFC 229 spotlight for themselves on October 6, the No. 5-ranked contender was a bit busy. First, he watched the aforementioned lightweights do their thing in Las Vegas, with Nurmagomedov successfully defending his title against McGregor and Ferguson defeating Pettis. Then, he got his next assignment – a December rematch with Al Iaquinta that will headline the UFC on FOX event in Milwaukee. But first things first, and that was the big fight between Nurmagomedov and McGregor. Nurmagomedov’s submission win upped his perfect record to 27-0, but Lee has long believed that he’s the one who will put a “1” in the Dagestan native’s loss column. And though he would love to get a shot at the belt now, he believes that next title fight shouldn’t belong to him. It’s a classy statement to make, and the 26-year-old’s decision to take a low profile when he could have made a lot of noise during the UFC 229 fight week also says a lot about this young man with a plan. It’s a wise call from a fighter who is the youngest in the lightweight top ten, but with youth comes impatience. Lee admits that patience is a work in progress for him. The next opportunity to show how he’s evolved is on December 15 against New York’s Iaquinta, who handed Lee his first pro loss in his UFC debut back in 2014. But a lot has changed since then, something never more evident than when Lee put in a brilliant performance in stopping Barboza in the fifth round. But ask Lee about the bout, and he’ll have more negatives than positives to say. That means he’s quite amped up to meet “Raging” Al again, and while some fighters predict quick finishes (and Lee wouldn’t mind one), he’s got a feeling that both he and Iaquinta will need to pack a lunch for this one. “We do have that history and it is a little bit of redemption for me so I like that part of it,” Lee said. “I get to avenge something that shouldn’t be there. (In the first fight) Al took on a young kid that really had no business being in there, who didn’t know what he was doing, and now he’s facing somebody who’s been around the block a couple times. So I get that little bit of redemption, but mostly, Al’s tough, so he can stay in there for the full five rounds and keep on fighting back, and that’s what’s getting me up because I think it’s really gonna show people a great fight. That’s fighter talk. And if he evens the score with Iaquinta, he wants to get around to some champion talk. He’s not in any rush, but when the call comes, he’ll answer it.